It took two seasons for Facaner Medina to see his name spelled right on a baseball card. It also took him two seasons to get out of rookie ball. Once he did get out of rookie ball, Medina didn't go much further. He played in two more seasons, never getting to AA. 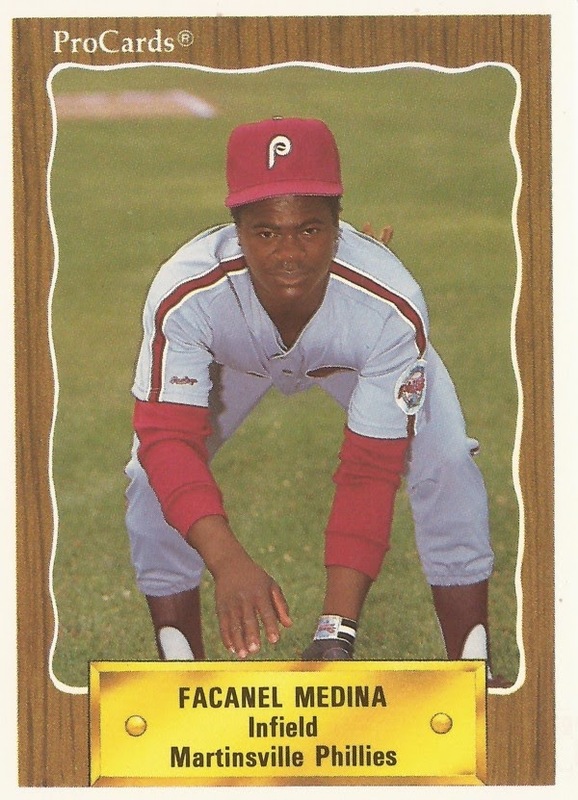 Medina's career began in 1989, signed by the Phillies as an amateur free agent out of his native Dominican Republic. He played his first season at rookie Martinsville. In 29 games, the second baseman hit .200. He also stole 12 bases. That first year, Medina made a Martinsville baseball card. His name was spelled Facanel Medina. Remaining at Martinsville for 1990, Medina again graced cardboard and his name was again spelled with an "l."
He hit .245 in his second year in rookie ball, moving from second base to outfield. Also in his second year, Medina was joined by his brother Patricio Medina, according to The Philadelphia Inquirer. For 1991, Medina moved to short-season Batavia. He also had his name spelled correctly on his card, or at least how Baseball-Reference and The Baseball Cube spell it, Facaner Medina. He hit .222 at Batavia, with 16 RBI and 20 stolen bases. He's credited as moving to the White Sox and high-A Sarasota for 1992. His stay there, though, was brief, just 11 games. It was his final season as a pro.